I don't know about you but I am more than ready for Spring to get here.. With the third snowfall last night here in Virginia Beach, I am now very eager to hop into Spring. 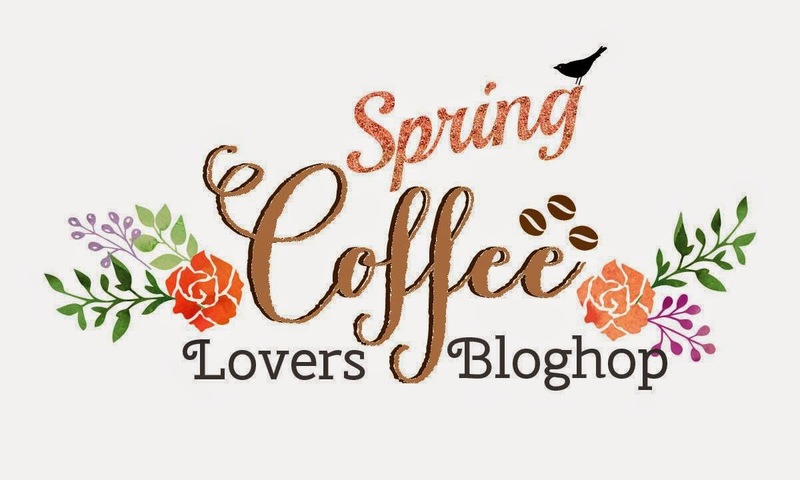 And what better way than with a Spring Coffee Lovers Blog Hop. I missed the Holiday themed Hop so this time I am thrilled to be able to participate !! And now we even have a new home to post all of our coffee, tea and cocoa creations. Check out the entire Hop here to see everyone's amazing projects and all of the wonderful sponsors. I will be posting several starting today until it ends on March 6.. There will be some great prizes from amazing sponsors throughout the Hop... I will also be choosing someone to win some Spring supplies from those who comment on my posts during the Hop..
For my first card, I finally inked up a stamp that I have had for awhile. I was planning on using it for the Holiday Hop but computer issues got in the way. 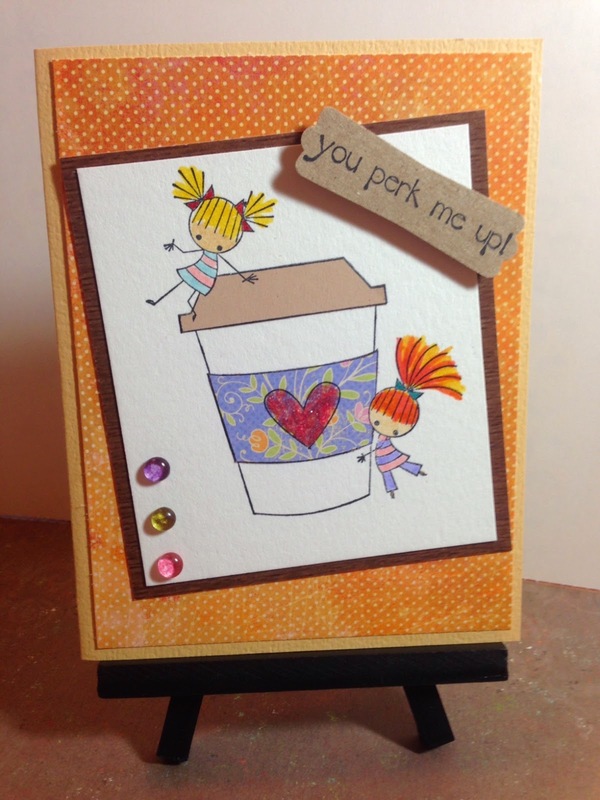 It is "Perk Me Up Peeps" by Stampingbella. You can't help but feel good when you see these 2 cuties !! I also used a bit of Basic Grey paper and some Robin's Nest Dew Drops in Orchid and Poinsettia.. Welcome to our anticipation of Spring !! Ahhh I love those little girl images pushing the cup... super cute! Thanks, Emily !! This stamp is a cutie !! Thanks, Jessica !! Yep, some melting today but far from back to normal,,, It is supposed to be 70 on Wednesday !! Next time you visit, we will have to meet for coffee !! And, yep--I love those little Dew Drops too !! Oh, how CUTE is this?! !...Love it! Thank you, Shelly !! I love this stamp--they are so cute !! Thanks, Kelly,,,,This card just cheers me up on this cold day !! Adorable card, Deb! In ready for spring too!! Love that fun to-go cup! So glad you could join us this time! Hoping Spring gets to you guys soon...I know that you've been hit with so much snow! Amy, another great HOP !! Thanks for the inspiration !! What a fun card! It makes me smile and I love that sentiment!! It IS a fun card---thanks for saying so !! Super fun and colorful To Go cup, and love how you colored their hair. I colored the hair for my and my crafty sister, Jenn !! Thank you !! The girls look so sweet on the coffee cup- great idea!! Such a cute, happy card! How adorable! Love this sweet card! Adorable image! Lovin that orange ♥ Lovely card! I love this card showing you and Jennifer. I love how you colored Jennifer's hair. That is what I noticed first. Love the little colored dew drops. Wow this is so cute love the sentiment. Very sweet little card! Adorable! I love your card of Spring, Debra, love the colors and am so ready for warm weather as well! Have a fun time hopping and a wonderful weekend. Sweet little card! Fun hop! What an adorable card! How fun! Those are two cuties with the coffee cup! Great card! Totally cute...love the little girls! Ah this is adorable. Thanks for sharing. So Sweet these little girls!!!! Yay, SO happy that you joined in the Coffee Lovers Blog Hop! Have the best weekend!!! What a fabulous spring-themed coffee card! Those little girls are darling! Way too sweet! LOVE those dew drops!! Your little Peeps make me smile, Debra! Such an adorable card! This is so cute. It made me smile too. I love your card, this is very cute! Those cute little girls make me smile! oh Deb this is super fun! Cute! Those little girls are cuties and the sentiment is fun. Such an adorable card, love the little girls and the colorful holder. How adorable! Those little girls look a whole lot like me after I've had my first cuppa. Love the glitter heart on your mug. what cute kiddos around the cup! OMGosh those little peeps are a scream! LOVE this card! Oh cute, love those two little girls with their pony tails! Great card! This is so sweet Deb. What a cute card! Love it! That is sooooooooooo cute!! Really love those sweet little girls!! Aww this is so cute! I love the little girls.